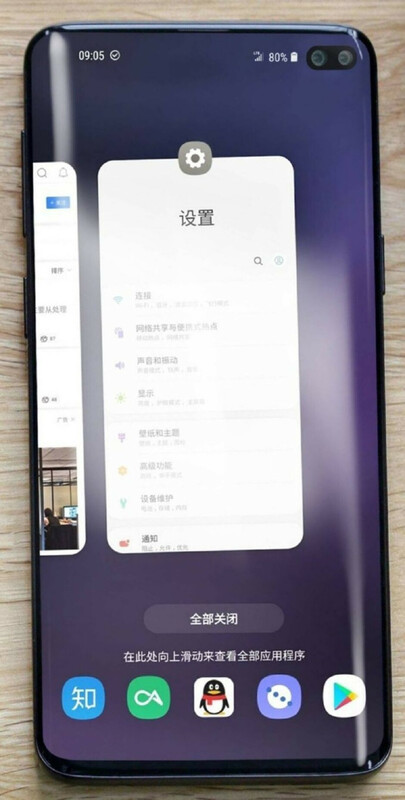 Leaks about the Samsung Galaxy S10 series are dime a dozen and we’re getting today’s offering straight from the Chinese social media Weibo in the form of yet another photo. 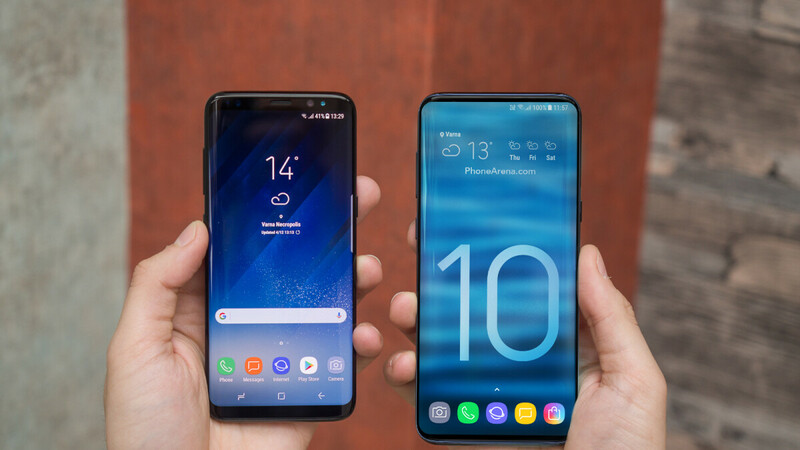 The picture allegedly shows the Samsung Galaxy S10+ in all of its punch-hole (more like punch-pill) display glory. Of course, we’ve already seen the device in previous leaks, so let’s see how this latest photo compares to what we already know. First off, the picture shows the phone with the recent apps menu opened with the suggested apps at the bottom, styled in Samsung’s latest One UI, so far so good. Taking a look at the top, however, we see some discrepancies between this leak and previous ones. The time here is positioned a lot closer to the middle of the display than it has been seen previously, tucked in the corner. Moreover, everything on the display seems to be at an angle slightly different from the device itself. The different time position could be a change Samsung made to have the clock and the battery/signal indicators more symmetrical because of the front-facing cameras. However, zooming in on the picture shows that the pixels around the time are a bit different from those surrounding them, which hints that there might have been some tampering with what we’re seeing here. Another difference is noticeable around the side buttons. 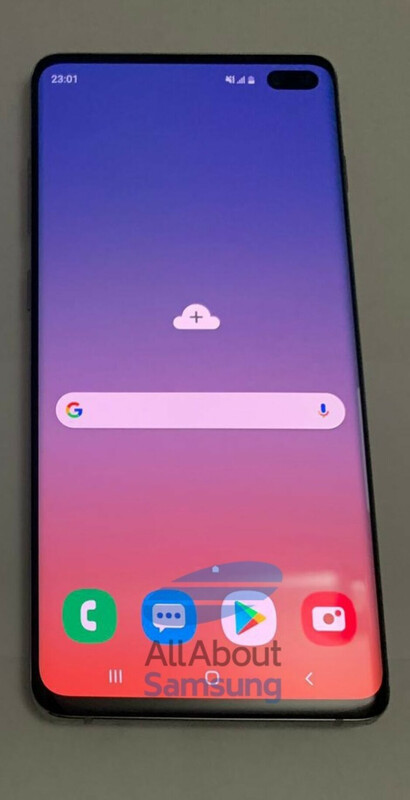 While on this picture the right-side button translates somewhere between the Bixby button and the volume controls on the left, like it is on the Note 9, for example, on previous leaks we’ve seen the right button a lot higher, closer to the level of the volume up button. This leads us to believe that someone is likely trying to get on the hype train with a self-made “leak” rather than having access to the real device. Either way, the official announcement is less than a month away. All will be revealed on February 20 at Samsung's Unpacked event. The first one looks fake. The power button's placement is quite high in most leaks out there (just like in the second photo). Am I the only one who thinks a display hole is even uglier than a notch? A pill-shaped display hole like the S10+, yes. A single round hole, no. Looks much better then ugly notch , give more screen then ugly notch. Thin bezels are the best. Agree. Gawd awful design choice. Putting a distracting eyesore on a screen around a front cam in which majority of users care for selfies 0.05% of the time. Either find a better solution or don't do it all. Small upper bezel been fine for years. It'll be fine til u figure out the ultimate solution. Not this half-assed cyclops Frankenstein abomination. In 10 years we are gonna be laughing how at some point having a phone with holes in it was cool and innovative. This is so backwards its funny. Either use a notch in the middle or hide the camera with mechanism. This all holes concept is just an abomination if you ask an actual designer. If you're impeding my screen (which I am not in favor of) I'll take this tiny cutout over larger unibrows like the pixel, iPhone, etc. way better than a notch and the implementation is right, sitting right on top with the statusbar, but haters gonna hate anyway. That stupid pill shaped hole ruins otherwise a great looking phone. Shame.